Why Play at William Hill Poker? When looking for a place to play online poker, you want a reliable operator that has been around the block a time or two. William Hill has been doing business since 1934 in the brick-and-mortar space and has brought its decades of experience to its online offerings. William Hill is licensed by the gambling commissions of both Gibraltar and the United Kingdom, so you can be assured that everything is honest and above-board when you deposit your money. William Hill is now a large, international operation that employs more than 17,000. But bigger isn’t always better; some firms forget about their loyal customers when they achieve a certain measure of success. Such is not the case at William Hill Poker. Besides a great first deposit bonus of up to £110, you can look forward to being regularly rewarded with cash, bonuses, and tournament tokens as a member of the Players Club. There are special promos for newcomers as well as varying monthly offers for long-time, regular grinders. If you need a break from the well-populated iPoker Network poker tables, check out the casino games, skill games, sportsbook, bingo, and other gaming options. Whether you like to play for pennies or hundreds of dollars at a time, William Hill has enough variety to cover almost all your gambling needs. 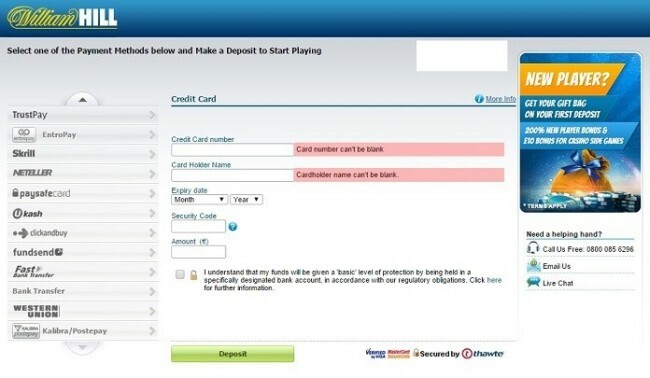 Unfortunately, William Hill DOES NOT accept players from the United States. This decision was taken after the passing of the Unlawful Internet Gambling Enforcement Act (UIGEA) of 2006. Visit William Hill now and play your favorite poker games! Be sure to claim your free Welcome Package when you make your initial deposit at William Hill Poker. You’ll qualify for a £110 Bonus + 10 Free Spins among other benefits. 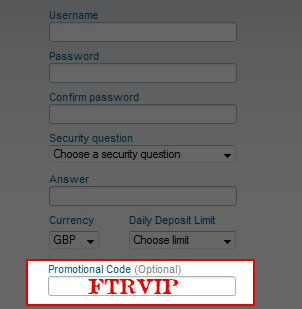 Although you don’t need to enter any codes when depositing to receive your Welcome Package, you should enter the code FTRVIP during the account creation process to ensure that you don’t miss out on any benefits to which you are entitled as an FTR player. Players using EUR or USD as their account currency will have the opportunity to receive a corresponding bonus in their currency of choice instead. After making at least a £10 deposit, you have to earn points to release the offers and bonus funds from the Welcome Package. At William Hill, the weighted contributed method of rake allocation is followed. This means that the proportion of rake you are credited with will be determined by the percentage of the money you have put into the pot. A total of 6,945 WHPs is required for the full £110 to become fully cleared. You will pay approximately £496.07 in rake, making the return ~22% back which is fairly standard. Along with the tickets and bonus, 10 free spins will be given to all players who make their deposit. These spins can be used on various casino side games and are completely free – you will not have to wager a dime. Any winnings are subject to a 40x wager requirement. For a full breakdown of the new player offer, make sure to read our William Hill Poker promotional code page to learn the terms and specifics. William Hill certainly pulls out all the stops when welcoming new players to its virtual poker tables. In addition to the New Depositors Gift Bag described above, there are certain promos that are only available to players who have recently opened their accounts. For the first 90 days after you open an account, you’ll be able to opt-in to Rookie Races. These races run once a week and pay a total of €500 in prizes to the players who play the most raked hands at games with a big blind of 0.2 or lower. The top 200 players will get a cash payout, and as long as you can rake 500 hands within a week, you have a high chance of earning a prize. During the week, you can check your progress and see how the competition stacks up on the frequently updated leaderboard. During the same 90-day period after creating your account, you’ll be able to partake in special tournaments. There are €20 Hill’s Welcome Freeroll MTTs at 11am GMT and 7:30pm GMT every day. There are also free Hill’s Welcome SitnGos that award a €1 tourney token to the winner. You can play in two of these SNGs and one of the MTT freerolls per 24 hour period. There are also special €0.10 + €0.01 daily New Players events with €30 guaranteed as well as €0.10 + €0.01 + €0.04 and €0.35 + €0.04 + €0.11 New Players KO bounty tournaments running every day. When your 90-day period to take advantage of newcomer’s specials expires, don’t worry; you’ll still be able to benefit from the wide range of other William Hill promotions. By opting into the Monday’s Cashback, you’ll be eligible to receive up to €15 each week based upon your play during the previous week. This is perfect for those looking to regularly augment their bankrolls with free cash. With the Chase the Cash opportunity, players are able to earn monthly prizes for hitting certain WH Points totals. You’ll start to be rewarded by receiving €17.50 upon reaching 9,500 monthly WHPs (raking $380), but the prizes top out at €2,000 for accruing 700,000 WHPs (raking $28,000). The Chase the Cash rake chase thus helps players at small stakes as well as nosebleed ballers who can generate incredible amounts of rake every month. While we’ve tried to give you a broad overview of the different special offers at William Hill, there are typically more than a dozen promotions active at any given time. We encourage you to regularly check Will Hill’s poker promos page to apprise yourself of any extant opportunities for free money. If you like multiple types of gaming, then you can get even more promotional offers from the sportsbook, casino, financial betting, and other products available at William Hill. While you earn WHPoints at the tables, you’ll also get Club Points. You can trade these points in for cash, bonuses, and tournament entry tokens in the William Hill Poker Club Points Converter. You can also use your Club Points to enter Bankroll Booster tournaments. In addition, there are special freerolls open to players in the Club. As you play more and more, you’ll advance through the ranks of the Players Club. The benefits of higher club tiers include more and better freerolls and superior points conversion rates. At the highest level, ClubStatus10, you can get benefits of up to 54% cashback! Learn more by reading our William Hill Players Club review. Head on over to William Hill Poker now to start playing today! William Hill was started in 1934 in the UK by its eponymous founder. At this point in history, betting shops were not allowed under British law, so Hill decided to take bets on sporting events via phone and mail. Clients would place their wagers by sending checks well in advance of the events they were betting upon. When betting shops became legal in 1961, it seemed to outsiders like a great boon to Hill’s business. However, he preferred to keep operating his bookmaking company in the old-fashioned way. He even believed that betting shops were bad for society because they made it easier for regular people to place bets quickly and on the spur of the moment. This was not the first time (nor the last) that an established market operator decried the emergence of new forms of gambling as social ills. Despite his reservations, William Hill opted to open his own betting shops after seeing the market gains that his competitors were making with these shops. By 1966, he had joined the brick-and-mortar betting shop market. William Hill retired from bookmaking in 1970 and died a year later. Over the next decades, the company was sold and merged several times with varying fortunes. A low point came in 1999 when the owners Grand Metropolitan sold William Hill to Brent Walker for £685 million. It soon emerged that the books had been cooked in order to achieve a higher price, and a couple of William Hill’s directors were even sent to prison. In 1998, William Hill inaugurated its online sportsbook. It followed this up in 2000 with the introduction of an online casino, but there was still a piece of the puzzle missing. 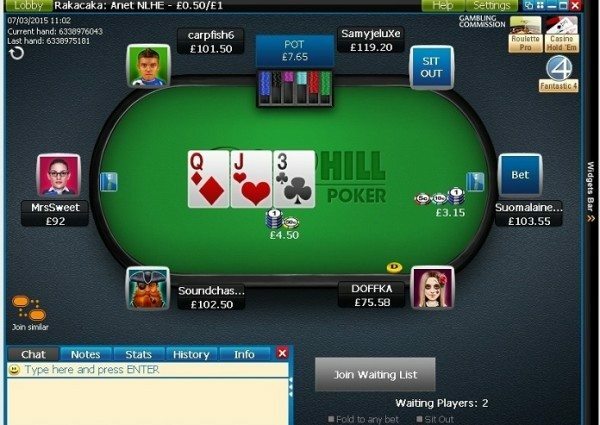 Finally in 2003, the William Hill online poker room was launched. The poker room operated on the now defunct Cryptologic Poker Network. In late 2006, William Hill exited the US market due to changes in federal legislation. This was an orderly process, and all American players received their account balances paid in full. Although somewhat popular in its prime, the software offered by Cryptologic soon started to fall behind its competitors in terms of features offered and general look and feel. Perhaps in combination with the network-wide decision to stop serving Americans, these factors led to declining player counts. In 2008, it was announced that the Cryptologic Poker Network would merge with the Boss Poker Network. Rather than moving to Boss Poker, another second-tier poker network, William Hill formed a partnership with Playtech, the people behind the iPoker Network. The migration to the new poker software was completed by April 2009. Players could now enjoy more games, larger traffic volumes, and a better playing experience. William Hill is currently a formidable player in both the traditional betting shop scene and on the Internet. There are more than 2,300 William Hill betting shops in the UK, making it the leader in that country with 26% market share. Moreover, the company has a physical presence in eight other jurisdictions: Australia, Bulgaria, Gibraltar, Israel, Italy, the Philippines, Spain, and the United States. William Hill’s online offerings include peer-to-peer poker, traditional online casino games, live dealer casino games, sports betting, skill games, bingo, financial wagering, and a new scratchcard product. In 2013, online products generated £446.3 million in revenue, contributing to total revenues of £1,486.5 million. The after-tax profit on these revenues was a healthy £226.5 million. 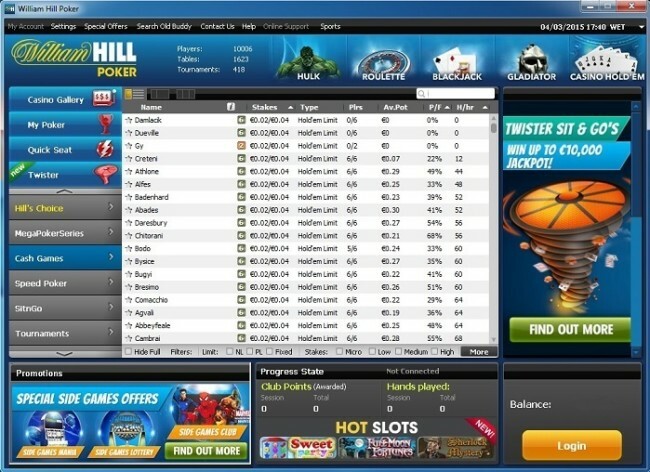 William Hill runs poker games through the iPoker Network, the operator with the third-largest global cash game traffic as of March 2015. There are frequent and numerous promotions offered to entice new players to join and existing players to keep playing. See why players over the years have chosen to play at William Hill Poker by opening your account today. The William Hill poker software was developed by Playtech. Since 1999, Playtech has provided software to online casinos, poker rooms, bingo halls, and sports books. Drawing upon more than a decade of experience designing and implementing online games, Playtech’s iPoker software is clean, crisp, and fast-moving. William Hill offers all the cash games, tournaments and Sit and Gos that you would expect. 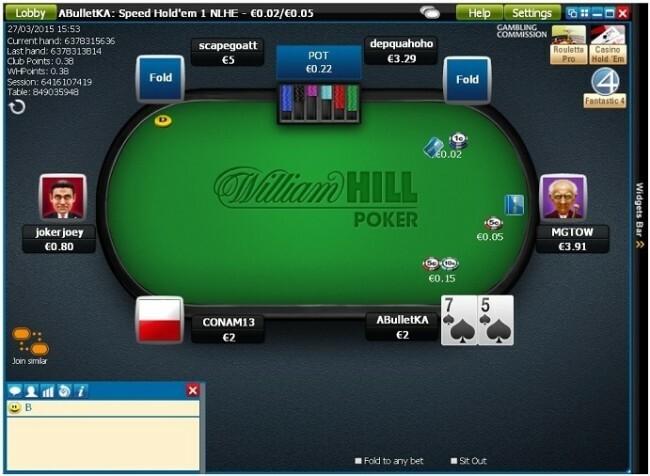 Although many pages on the William Hill website describe rake taken or points earned on pound, euro, and dollar tables, iPoker made the decision to eliminate games denominated in US dollars in November 2013. Thus William Hill offers games using GBP and EUR only. You’ll find Texas Hold’em, Omaha, Omaha/8, 7-Card Stud Hi, 7-Card Stud Hi-Lo, 5-Card Stud, and Razz games in the lobby. On the SNG front, Twister SNGs are a type of three-handed lottery SNG in which the prize pools have a chance to be multiplied by up to 1,000. Jackpot SNGs allow you to score a big jackpot if you should be fortunate enough to win a predetermined number of them in a row. The Lobby at William Hill is well-arranged and clear. To the left are various categories of games that you can select, such as “Cash Games” and “SitnGo.” Besides the normal categories that you’ll find at almost every poker site, you can also choose to view MTT series events, satellite tournies to live poker packages and a few other unique options. Upon making your choice, you’ll be presented with other choices to narrow down the list. After you’ve chosen what types of games you want to view, information about them will be displayed in the center of the lobby. You can sort these games by clicking the headings above each column. Filtering is available through the buttons towards the bottom of the lobby or you can click on “More” to access advanced filters. The poker client features a Quick Seat function to get players in the games they like the best without delay. William Hill tables offer the standard range of features you would expect to see at an online poker room of their size and popularity. The tables are fully resizable, and information like player notes and session statistics is available near the chat window, which is fully detachable and can be moved to your preferred position. An instant hand history function is also available. William Hill is also one of the few poker rooms which offer in–game side bets on which cards will be dealt on the flop, so if you like to gamble while you gamble, this is the right place for you! You can make bets on whether the flop will be suited, all red, all black, etc. A range of features enhancing multi–tabling is also available, including the ability to remember table positioning and hotkeys option for the table buttons. One downside, however, is that the hotkeys are prefixed for F1-F5 keys and cannot be changed, which is kind of annoying. 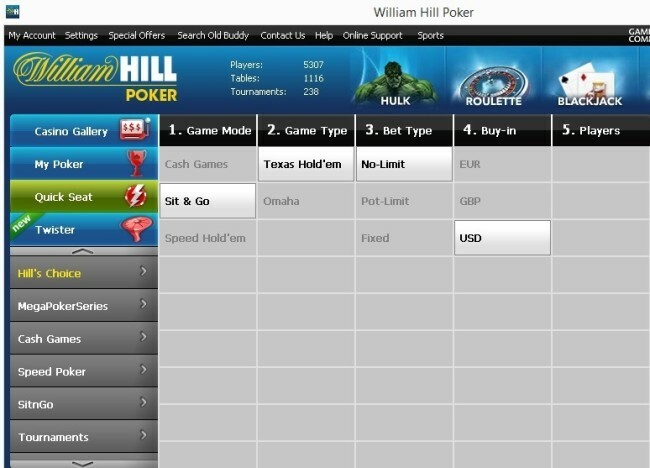 Fast-fold poker has taken the poker world by storm over the past few years, and William Hill is no exception. Called “Speed Poker” on the iPoker Network, these games allow you to quickly fold your hand and move instantly to another table to receive a new hand, greatly speeding up the rate at which you can play hands. Speed Poker is available in both cash and tournament formats. 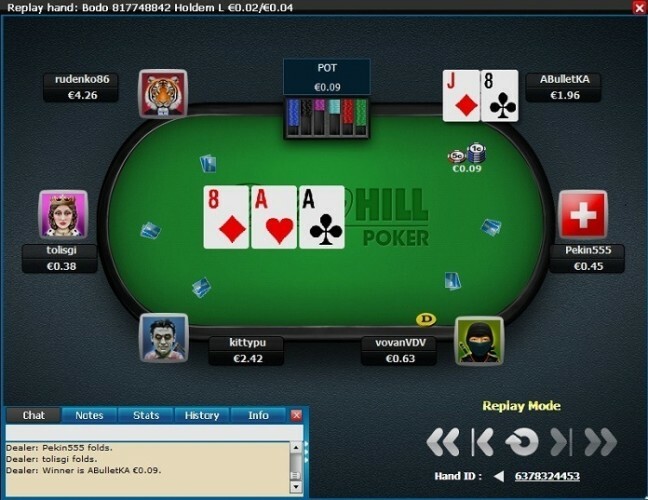 An Instant Hand History Replayer allows players to view each hand of their session in a fast and efficient way. William Hill did a good job building a functional replayer that does not cause any inconveniences when loading. Many replayers can be clunky and even cause tables to lag while they are launching, but in this case there are no such problems. The replayer can be used for cash games and tournaments. You can scroll through any hand manually or set a replay speed and watch it as it would unfold at the actual table. You can also pause the replay at any point if you want to review a certain situation. 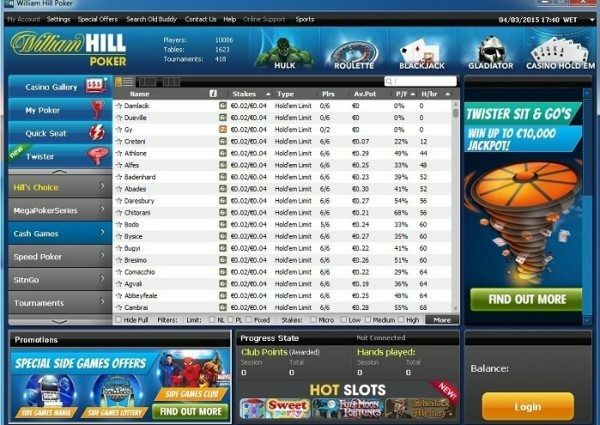 For a more in-depth look at the software used at William Hill Poker, check out our William Hill Poker Download and software review. Try out the excellent software on offer at William Hill Poker today. William Hill Poker is on the iPoker Network, which means that it shares traffic with the dozens of other sites. As of March 2015, iPoker has the third-highest levels of traffic among all poker sites and networks. The busiest times on the network seem to be around 5:00 pm ET, with some daily variation between 2:30 pm and 6:30 pm. This makes sense as these times correspond to 6:30 pm – 10:30 pm GMT, which is when people in the UK have come home from work and are hitting the tables in earnest. Oddly, the most popular day for players on the network seems to be Monday. William Hill spreads games at stakes ranging from €0.01/€0.02 through €5/€10 for No Limit Hold’em. While this may seem like quite a low maximum stake, there is a method to the madness. By capping the blinds at £5/£10, Will Hill ensures that games will run frequently at the highest possible stakes rather than having a wasteland of nosebleed games that nobody plays. Indeed, games run at these stakes even at non-peak hours though admittedly, some of this action is heads-up rather than full tables. Microstakes players will often find dozens of tables running at any time of day. Pot Limit Omaha games run from €0.02/€0.04 up to €5/€10 and similarly attract regular action, even at the largest games spread. Limit Hold’em tables are available from €0.02/€0.04 to €20/€40. There are generally a handful of games running at all times. However, action at the highest stakes is often limited, and most games seem to run at €1/€2 and below. SNGs range from €0.10 buyins up to €5,000. There are usually at least two or three Sit and Gos running at all times at every stake ranging from €0.10 through €20. During peak hours, the action often reaches as high as €500 or even €1,000. However, the fact that there are multiple types of SNGs offered – including Heads-up, Jackpot, and multi-table formats – means that it will be hard to multitable unless you’re willing to play more than one type of SNG at a time. Even LHE SNGs sometimes fire, a rarity in today’s online poker climate. If you’re playing for €10 or less, however, there are typically enough games running for you to focus on one specific format. There are plenty of freerolls at William Hill Poker as well as tourneys that take Club Points as buyins. At the other end of the scale is the €75 Big €5,000 GTD, which runs every day from Monday – Saturday. On Sunday, there’s a full tournament schedule, which culminates in the €30,000 Sunday Masters with a buyin of €150. However, the largest-buyin weekly tournament is the €25,000 Grand Monday, which costs €250 to enter. In addition to these regularly scheduled tourneys, the iPoker network runs an annual series called iPOPS, which has a variety of events at different price points to entice both low-stakes recreational players as well as serious, high-stakes individuals. The freerolls often draw several thousand runners while micro-stakes tourneys tend to get between 100 and 500 entrants. Tournaments with buyins greater than €20 seem to regularly draw fewer than 100 participants. An exception to this is the Sunday schedule, which attracts between 200 and 1,500 players for each event. iPOPS series events are also more popular than most normal tourneys, drawing anywhere from 300 to more than 3,000 entrants depending on the buyin level and other variables. Take a seat at your favorite type of poker today by creating your William Hill Poker account. William Hill offers dozens of convenient ways for you to fund your account and to request withdrawals of the winnings that you (hopefully!) earn at the tables. Check out the info on the right-hand side of the page for more about the available cashier options. Note: Some of the methods available at Will Hill for depositing/withdrawing money are restricted to certain geographical areas. Always check within the poker software for accurate information about which methods are available to you. There are more than 30 different options that customers can use to make deposits. The minimum transaction for most of them is a low £10. Don’t let this fool you, however. William Hill can take care of you if you’re looking to fund your account with a substantial sum. The maximum deposit amounts vary depending on the specific method chosen, but in some cases, they are as high as £100,000. If you’re able to use a credit or debit card, then you can conveniently fund your account with between £10 and £99,000, and the transaction will occur almost immediately. This is therefore the deposit method that we recommend to you if it’s available. Depositing at William Hill is easy and is done in two simple steps. First, you need to log in to the William Hill client and click on “Cashier.” This will take you to the Deposit window on their website. In the left column you will see all the deposit methods available to you. Choose your preferred deposit methods and then fill out all the necessary information. Click “Deposit” when you are done and that’s it! Deposits are usually processed instantly, so you won’t have to wait for your money to appear in your account. Because William Hill offers many different types of gambling, you might have to transfer your money after you deposit from your Main Account Balance to your Poker Account Balance. You can do so by logging into the William Hill website, clicking on “My Account,” and selecting “Transfer Funds.” Choose “Poker Account Balance” from the second drop-down menu, and enter the amount you wish to transfer. Then click on “Transfer Funds,” and you’ll be ready to hit the tables! Please note that it is the value of the first transfer you make to the poker room that will determine your first-deposit bonus and other rewards, not the total amount you deposited. So be sure to follow this step faithfully to maximize your rewards! Withdrawing from William Hill is very easy. All you have to do is click on “Cashier” in the poker client or go there through the William Hill homepage. Once the cashier is open, click on the “Withdraw” tab at the top right of the screen. Now all you have to do is enter the amount you want to withdraw. Keep in mind that you can only withdraw money using methods that you have used to make a deposit. Also note that you may have to provide certain documentation pursuant to William Hill’s Age Verification process and Know Your Customer (KYC) guidelines. Although the poker site will attempt to complete the necessary checks through an automated system when you sign up for a new account, it may be unable to satisfactorily complete this process. In this case, your account might be suspended until you provide the necessary documents. Assuming the proofs of identity you provide are authentic and legible, your account will be fully activated and any restrictions that had been applied will be removed. Make your first deposit at Will Hill today! William Hill showcases a mobile app on its website, but poker is not offered on it, only other gambling products. This is quite a noticeable lacuna in William Hill’s mobile product offerings, especially since other poker rooms on the iPoker network, like Winner Poker and Bet365 Poker, do have mobile poker apps. As befitting an operation of its size, William Hill Poker maintains several convenient ways for its clients to get ahold of it. You can access a Live Chat feature from the “My Account” page while logged into the website. You can also use a webform to send a message to support regarding your account. If you’d prefer to chat with someone over the telephone, you can call an international freephone number. Below are the numbers to dial if you’re located in certain popular countries. If your country isn’t listed, you can probably still dial the 00 800 3551 3551 international freephone number. However, if you cannot, you can use the number +44 870 600 0479, but you may incur charges from your telephone carrier. With a long and storied history and a full-featured gambling website, William Hill is one of the top places to play poker online, particularly for clients in the United Kingdom. The welcome bonus is quite respectable, and there are tons of other promos constantly running to give you the rewards you deserve. With plenty of cashier options and a sizeable volume of player traffic, it should be no problem to fund your account and start playing today. Begin playing at William Hill Poker for non-stop poker action! Create your new Will Hill account now! You can find more information on the William Hill Poker promo code here.